Check Your Gutters: Energy.gov warns that leaves that piled up in your gutters the previous fall could wreak havoc on your home the following year. Gutters clogged with leaves means that rain water can’t drain properly. 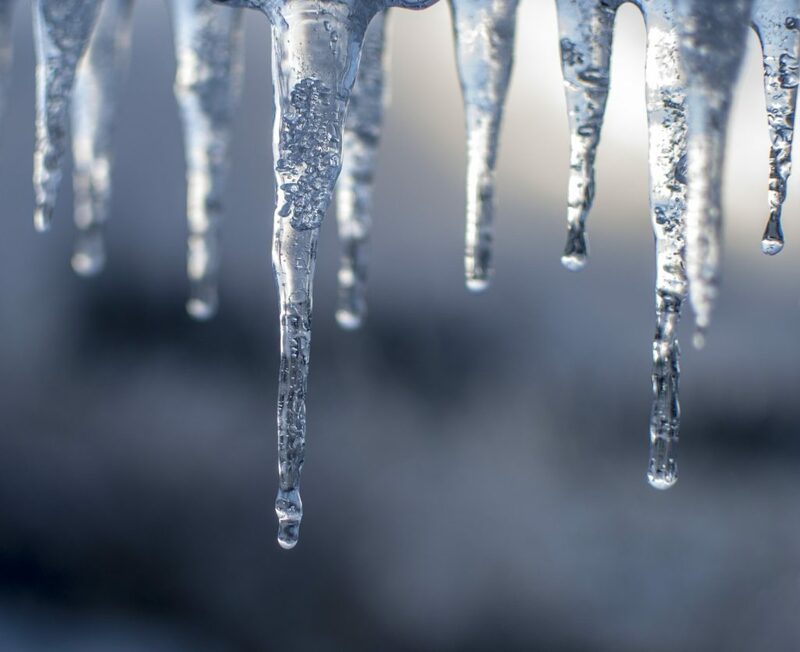 That water can freeze and – even worse – can start to leak into the home causing water damage and the risk of mold growth. While this is not necessarily a concern for a new home, it’s a great practice to incorporate to your home maintenance routine over the coming years. Schedule an Annual Heating Checkup: The Weather Channel reminds us that as colder temperatures take hold, homeowners turn on the heat for the first time in months. A cold night is not the best time to discover that your HVAC system is not in the best operating condition. The best way to avoid this is to be proactive and schedule a heating checkup. Again – this is not a necessary step for a brand-new home, but it will be an important step in the future. Check the Damper: Cold air has a way of getting into the home in a number of unexpected places. One of those places is through the spot most commonly associated with keeping you warm – your fireplace. Be sure to check your damper to make certain it seals tightly when closed to keep the cold air out, but also check to make sure it opens properly so smoke and fumes can filter into the flue and outside of the home. Seal Your Windows and Doors: While we’re on the subject of drafts, Energy.gov also warns that windows and doors that are not properly sealed can allow the cold to creep indoors. Begin by going around your home to check each for drafts. If you can’t sense it by touch, you might want to try lighting a candle and holding it near all four sides of your doors/windows to see if the flame flickers. If so, caulk or add weather-stripping to help minimize drafts. Much like adding an extra blanket to your bed in wintertime, incorporating heavier drapes is another measure you can take around windows that are particularly drafty. Safeguard Your Outlets and Power Switch Plates: Another often overlooked place where drafts can creep in are power outlets and switch plates. Insulation may SURROUND the outlet or power switch but is rarely if ever placed INSIDE the space where the plate lies. Take an inventory of the number of power switch plates and outlets in each room – particularly those set on exterior walls, then invest in foam gaskets to place behind each plate for an added layer of protection against drafts. Protect Outdoor Faucets: Faucets on the exterior of your home run the greatest risk of freezing and bursting if water is still caught in the pipe. To safeguard against that happening, The Spruce recommends making sure the valve that supplies water to the faucet is turned off, but the handle of the faucet itself is opened to allow any remaining water to drain out of the pipe. Trim Trees Around Your Home: It’s something NONE of us like to imagine, but in the event of a major winter storm, branches heavy with ice or snow can break off and harm your home or property. Make an assessment of the trees around your home and trim back any branches that might cause a problem. Check Your Furnace Filters: While most air filter manufacturers recommend changing them every 1 to 3 months, it’s a good idea to get in the habit of at least CHECKING them for buildup every 4 to 6 weeks. Having a clean filter means your furnace will run more efficiently and the air quality inside your home will be improved. With less likelihood of opening your windows to let fresh air in during the cold weather, that last part is really important. Insulate your Water Pipes and Water Heater Tank: Energy.gov brings it home for the win with another great DIY project. Insulating your hot water pipes reduces heat loss, can raise water temperature 2°F–4°F hotter and reduces the risk of them bursting during a hard freeze. By doing so, you could effectively lower your water temperature setting and lessen your wait times for the water to heat up in the shower. By insulating the tank on your water heater – which is often located in a cold garage or basement – you could cut standby heat losses by 25%–45%. Pre-cut insulation jackets or blankets are available for as little as $20. As an added bonus, many of these steps will not only increase the seal inside your home to protect from warm air escaping and cool air from creeping in, but they will also reduce your power consumption and help you save money on your energy bills. Paran Homes takes your family’s comfort very seriously. That’s why we are proud to offer energy efficient construction in all of our homes along with Smart Home technology (per plan/per community). In search of the new home of your dreams in Atlanta, GA, Nashville, TN or Raleigh, NC? We encourage you to discover the Paran Homes’ difference by visiting one or more of our communities throughout the Southeast today. To view our current communities, search available homes/home sites and find directions, please visit us online at www.paranhomes.com.